“I’m mortified to have to pay 50%!” So said the phenomenally successful singer Adele in an interview with Q magazine. And why shouldn’t she be? Isn’t it unfair that a person can perform labour for which they get less of the reward than someone else who didn’t perform it? The right to work as you wish and dispose of the fruits of your labour as you wish are essential rights that differentiate free men and women from slaves. Agreeing with Adele seems a moral slam dunk. This is true historically but the obvious response would be ‘So what?’ It’s worth remembering that the period when these penally high tax rates were in place wasn’t exactly a golden one for British economic policy making with the ‘stop – go’ spasms and sterling crises of the 1960’s giving way to the rampant inflation and economic mayhem of the 1970’s. High taxes are no better an idea now than they were then. The reason high taxes were and remain the wrong policy prescription is a very obvious one; the more you tax something the less of that something there is. That is why governments pile taxes on cigarettes and alcohol, (they claim) they want there to be less smoking and drinking. The problem the left had when it imposed high taxes before, and has now that it would do so again, is that while it accepts that this obvious and empirically proven proposition applies to fags or booze, it refuses to see it in action anywhere else. It was this economic blind spot which led Labour to campaign at the last election for a tax on jobs under the strange notion that it would not lead to fewer jobs being created. Fundamentally, this problem stems from the left’s assumption that everyone is (or ought to be) just like them. Because they are happy to be servants of the state, seeing it as some benign Rousseauian manifestation of the General Will, they are happy to hand large chunks of their pay packets over to it. The rest of us, however, are slightly more sceptical of the obviously crazy notion that every single copper coin of government spending is virtuous of itself. Thus, when taxes on our earnings go up, instead of redoubling our efforts and congratulating ourselves for supplying yet more income for the state we tend to be a bit annoyed and wonder what the point of putting any extra effort in is when more than half of the reward for that extra effort will be taken from you. Your effort slackens. You reduce your labour or you go and do it somewhere else. With less labour going on, the state’s income from taxes on labour falls. We saw all this back in the high tax Keynesian heyday of the 1970’s and look where it got us. Taxes went up and The Rolling Stones rolled off to the south of France with their millions and watched on TV as Denis Healey went to the IMF in 1976 to ask for a loan to pay the government’s bills. It was all rather gracefully explained by the Laffer Curve which took this obvious insight and formalised it. With a tax rate of 0% the government would obviously receive no revenue. But, Laffer argued, with a tax rate of 100% the government would also receive no revenue as all activity would grind to halt because of the disincentive effect of taxes which took all the reward of your labour. This was, and remains, a direct challenge to the left wing notion that because all public spending is good there is no disincentive effect from higher taxes; that despite receiving less and less of the reward for their labour, people will continue to provide the same amount of taxable labour regardless. To a left winger there would be no Laffer Curve, simply a diagonal line sloping upwards from bottom left at a 45 degree angle. There is a Laffer Curve shaped mountain of empirical evidence to support this basic contention. Yet the statists’ opposition to this economic truism has often been simply hysterical, even from noted economists. This is because they understand the implications of the Laffer Curve. It sets a cap of t*, whatever the precise numeric value may be, beyond which the state’s share of the economy cannot advance. At some point taxes will rise so high that they will start to decrease revenue, the limits of statism are reached. That is why people like Adele, Philip Green or, indeed, anyone who questions even taxes of over 50% is considered not just wrong but evil. Adele can take comfort that she has morality and economic fact on her side as well as talent. Next articleWhy has George Soros sold his gold? Many Guardianistas are of course merely following their self interest in lambasting anyone who challenges our eye-wateringly high tax levels. After all, some 50% of GDP is now in the gift of the state, and outside of the South East that rises to 80% plus. It is clear that the overwhelming majority of Guardian readers are employees of the State and para-State of think tanks, health services, BBC, charities etc. If someone wants to try to take the source of my living away, I too would react emotionally rather than logically, and may even act against the long term best interests of my country and my children and grandchildren. There have been important criticisms of the Laffer curve and it’s use, that make a great deal of sense from the Austrian point of view. The first problem is that the curve isn’t really “portable” from on situation to another. At any particular time it’s true that if a tax is zero then revenue is zero, and it’s similarly true that if a tax is raised to 100% then revenue will fall to zero quickly. But, the point where the maximum revenue is obtained varies from time to time. If the point of maximum revenue is x% in one country, then it may be y% another. It can vary from time to time too. It obviously varies with the culture of places, if jobs that earn high wages also earn a lot of fringe benefits in higher social status then that can offset higher taxes. The problem here is a classical mainstream economics problem – something that is best described in terms of microeconomic reasoning ends up being described by an empirical curve. Then critics can attack the predictions made from the curve with some justification. It could also be argued that if the government dropped the compulsory rate of taxation to 0% and requested voluntary payments that the actual revenues would not fall to 0. I very much agree with you current. Someone asked me to put a numeric value on t* and I had to ask a number of questions such as what sort of tax we were talking about (income or capital gains), the point being that there isnt some golden percentage in an economy. 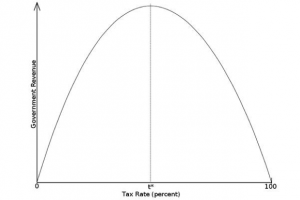 I think one of the traps the supply siders fell into was trying to construct an actual Laffer Curve. Still, I think it is a powerful illustration of a trusim. Like much else that gets passed off as empirically quantifiable economics, if you keep that in mind it can be a very useful tool. Therefore the more you tax work the less people work. At any particular time it’s true that if a tax is zero then revenue is zero, and it’s similarly true that if a tax is raised to 100% then revenue will fall to zero quickly. But, the point where the maximum revenue is obtained varies from time to time. Yes, it does. But I’ve never heard a true supply-sider claim differently — though many others have. That doesn’t, in the slightest, detract from the curve’s value. It’s true that some Austrians have criticised the supply-siders, but usually that’s been for their relative comfort with fiat money and its attendant problems than because of any serious disagreement with the Laffer Curve. It’s true that this is mainly an accusation against supply-siders rather than their actual view. But, from time to time you will find someone making cross-country tax comparisons, saying “if this country reduced tax X and it boosted revenue then it will here”. This isn’t necessarily true and ignores the great differences between tax codes in different countries.